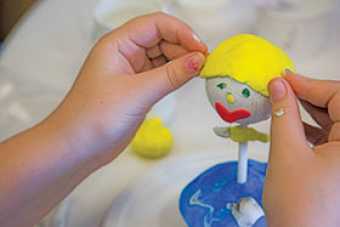 In a sunny room in Doernbecher Children’s Hospital, located in Portland’s Oregon Health and Science University (OHSU), a two-year-old girl and her mother are enjoying an art group. The little girl, Ida*, is wearing a pink tutu and purple smock, and her bare hands and feet are covered with blue and green paint. She and her mom are making a gift for her grandpa: an apron covered with the girl’s handprints and footprints. The cheerful room is decorated with children’s paintings, a quilt patterned with whimsical dogs, and a folk art textile embroidered with flowers. Children and adults alike perch on tiny chairs, ready to get to work at tables covered with drop cloths. A cart holds bottles of paint, paper, and other inviting art supplies. Two women run the group, greeting the kids and their friends and family members, suggesting projects, and providing art materials. They are teachers from Children’s Healing Art Project (CHAP), a Portland nonprofit dedicated to providing hands-on art experiences for kids with illnesses and disabilities. Family members are also encouraged to participate, and today I’ve been invited as a guest. One of the teachers is Mary Miller Doyle, BS ’77, who’s wearing jeans covered with bright, hand-painted flowers. She has a friendly smile and relaxed, respectful presence, and it’s easy to see why kids would want to create art with her. Doyle, who studied fine art at the UO, has worked with CHAP for eight years. 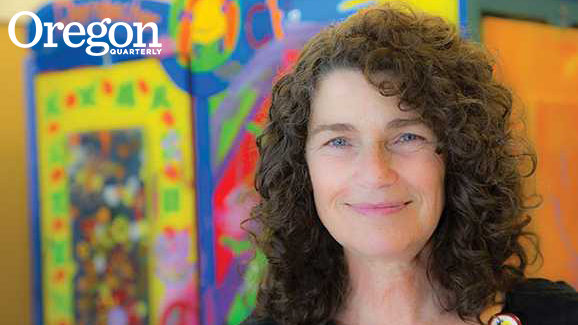 Along with the art groups for children and their families at Doernbecher, Doyle leads groups for adolescents and young adults at OHSU’s Knight Cancer Institute and for children at the Harold Schnitzer Diabetes Health Center. Kids sometimes stay in the Doernbecher unit for many months, and these groups provide opportunities for families to form friendships and support each other. A lot of this job is to witness what families and parents are experiencing, says Doyle, to let them know that “I see how strong you are. I see how hard this is for you.” She explains that for the kids, art groups are an opportunity to have fun, to make their own decisions, and to have an identity based on something other than illness. Maggie* is an eight-year-old girl with short and thinning hair. Like several of the kids here today, she has her IV pole at her side. Maggie decides to make a painting that looks like brightly colored hills in a landscape. Even though a monitor on her IV pole occasionally beeps, summoning nurses to make sure it’s functioning properly, she continues to work, intent and calm. As Doyle refills the child’s paint tray, she reminisces about a time when Maggie and her brother made a picture together. “It looked like a map of your imagination!” Maggie smiles as she paints. After graduating, Doyle moved to Boston. She studied illustration at the Art Institute of Boston, and began to achieve recognition following a show at the Harvard Book Store café. In addition to being shown in galleries, her work was reproduced on cards, posters, and magazine covers. After Doyle married, she and her husband moved back to Oregon to raise their three children. Not all of the kids in today’s group are happy, at least at first. Katrina*, 13, is withdrawn when she arrives, but reluctantly says she might want to make something. Doyle suggests various projects—a decorative lantern night light, an apron, a painting—but whether it’s due to physical discomfort from her illness, too much going on in the room, or adolescent self-consciousness, Katrina begins to complain that no one is paying attention to her, she doesn’t like any of the projects, and everyone should just leave her alone. Doyle gives her support and kind attention, at the same time addressing the needs of the other folks in the room. It’s clear that Katrina feels heard and accepted, and before long her hurt feelings are soothed. Soon she is intent on making a clay sculpture. Doyle’s interest in CHAP is personal and passionate. One of her sons (now 19 and healthy) needed two open-heart surgeries before the age of two. When her children were grown, Doyle decided that she wanted to use art to help kids confronting medical challenges, as her son had done. Her first thought was of Doernbecher. She made a call, met CHAP’s founder, and in short order was on board as the organization’s first employee. When it’s time for me to leave, Doyle walks with me down a hallway lined with patients’ rooms. She invites me to look into one belonging to an 18-year-old. The walls are filled with art, his own and gifts from other patients. Dragons, tropical islands, slogans, and superheroes cover every surface. Next to the bed is one of the decorated colored paper lanterns that the kids love to make. It’s nice to know that these warm and comforting little lights shine in so many rooms every night. *All patient names are fictitious.